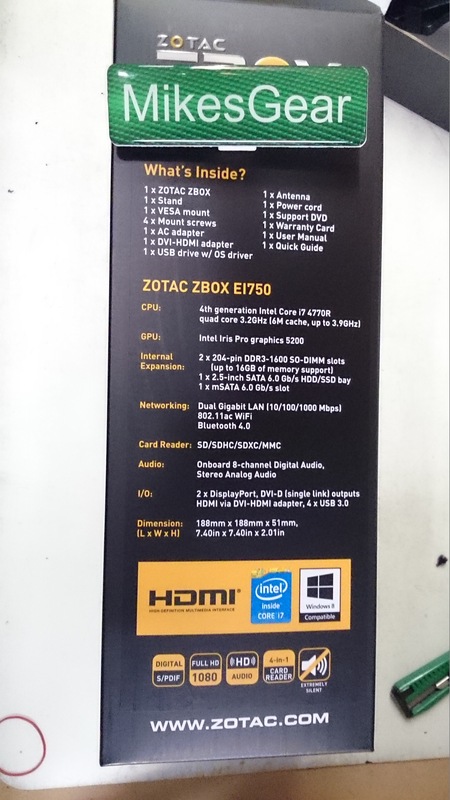 What can you say about Zotac? 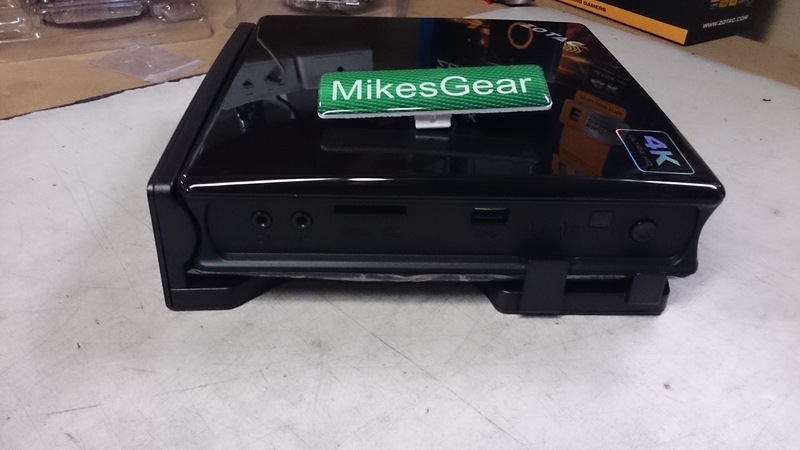 They make tiny little barebone PCs that are the size of paperback books, packing desktop-equivalent hardware into a case designed to clip to the back of a desktop PC monitor. The beauty of their barebone systems is that you can pick whatever size/price RAM and drives you like, unlike laptops, so there’s bound to be something for everyone’s budget. And, they can be assembled in a few minutes without any tools. 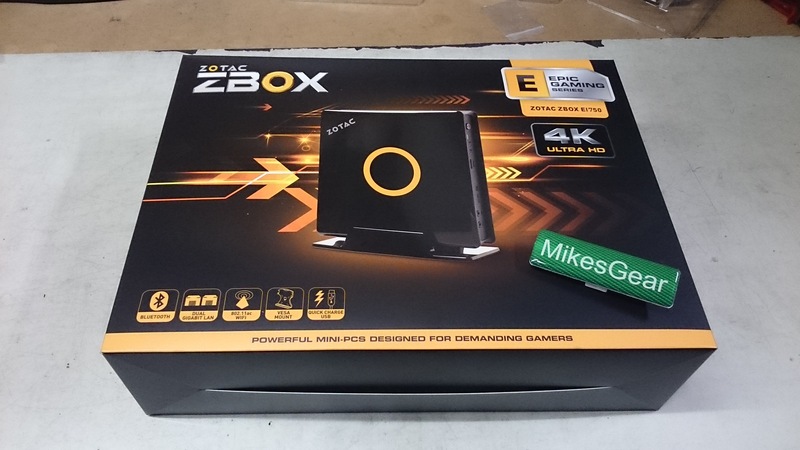 Their latest ZBox lobbed in to Australia for the first time today – the EI750, which packs the power of a top-end 4770R Core i7 CPU (4 physical cores, ultra-low power consumption), and very powerful Intel Iris graphics, with support for 4K monitors (not that there are too many of those in the wild yet). Just 188mm x 188mm x 51mm in size, it is fairly quiet, and has an illuminated ring in it’s lid. 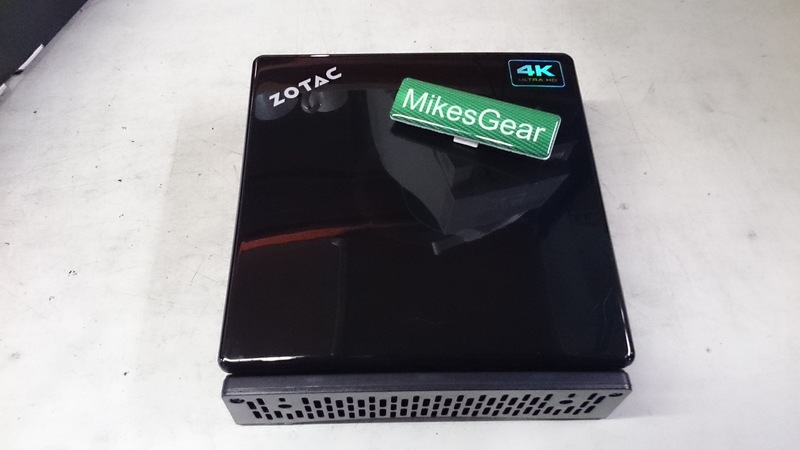 You get the kind of performance gear that is usually only reserved for big tower PCs, room for up to two fast SATA 6G drives, and the ability to connect up to 3 displays at once. 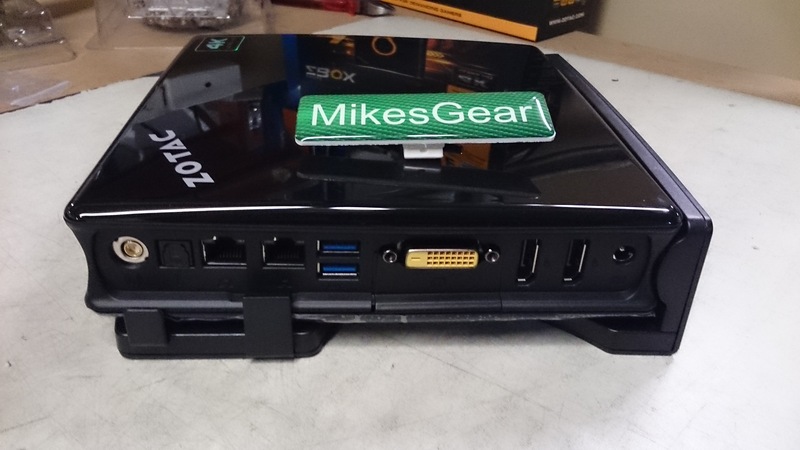 All these features make it one of the most-expensive ZBoxes I’ve seen to date, but then again, a similarly-specced desktop wouldn’t be much cheaper, and would use 2x-4x the power of this super-efficient unit. Read on to see what the EI750 is like. All ZBoxes I’ve seen come in the same carton, which fits nicely into a courier airbag, and is jam-packed with extra foam to protect them, well enough that we’ve never had one damaged in shipping. 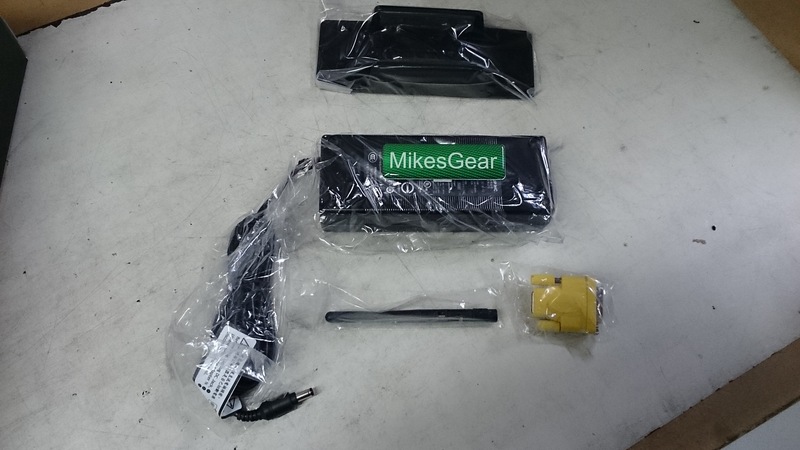 This is the accessory package contents – the 120w power brick similar to a laptop power supply, Wifi Antenna, DVI to HDMI adapter, and desk stand (in case you don’t want to use the Monitor mount). Not pictured are the manual, driver CD, and Australian power cord. 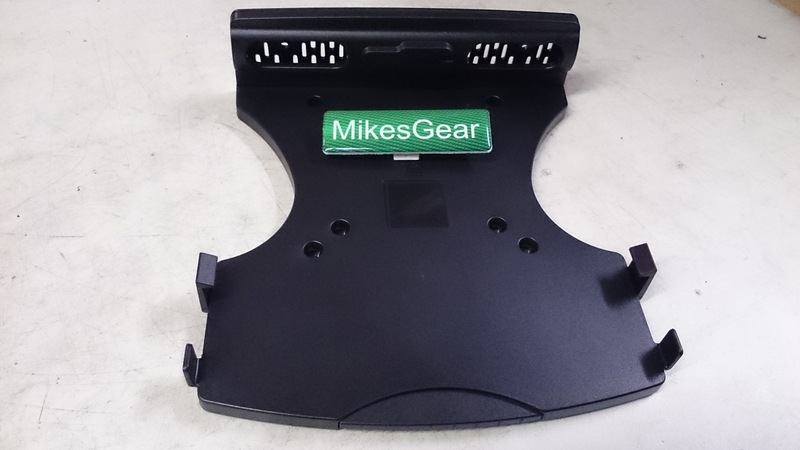 The unit itself comes clipped into the VESA-mount that you can use to clip it to the back of a PC monitor. You press the half-moon piece in towards the base and it releases the claws on the side, so the ZBox can be removed from the mount without using a screwdriver. Moving on to the edges of the EI750 below, this side has the Wifi Antenna socket for the 802.11AC, then there’s an optical audio port, two gigabit network ports, two USB3.0 ports (two split between other sides make up a total of 4 of them), a DVI port, two DisplayPort ports, and it’s power input. This side pictured below has some 3.5mm analogue audio ports, a flashmemory cardreader slot for SD/MMC cards, activity LEDs, and a power button. There’s no analogue video outputs (VGA) and you can’t use a converter on the DVI port to make analogue video, as it’s DVI-D (Digital) only. If you had to use this with an old VGA-only display, a USB or Digital Video-to-VGA display adapter would be the only option. There’s also no optical disc drive, so you’ll be installing your operating system from a USB drive of some sort. Opening a ZBox is a doddle – two thumbscrews on the base to undo, and the bottom slides right off in your hand. Now, we can see the giblets inside. There’s a cooling fan with copper base / aluminium fins covering the CPU/GPU (that’s not meant to be removeable). Whilst this is similar to the kind of cooling used by laptops, you will hear the fan outside the unit. On the lower-right, there’s the Wifi/Bluetooth 4.0 MiniPCI-E card. Under the badge is the 2.5inch drive bay (accepts laptop SATA drives and SSDs) and RAM slots. Here’s a closeup of the drive bay area – the left-side stacks the 2.5inch drive retaining clip on top of the two DDR3 SODIMM RAM slots (same 1.5v RAM that laptops use). The space on the right has room for an mSATA SSD (Solid State Disk), so you could potentially populate this with two disks. The Intel chipset that runs the disks can make up a combined drive that gives you the speed and low latency of the mSATA SSD with the extra capacity and cheaper price-per-Gigabyte of a 2.5inch spinning-disk. To be frank, if you were going to lay down the kind of dough this unit requires, I’d use all-SSDs in the storage area, as the disks are far-and-away the slowest components in any PC, and the overall responsiveness of a system is constrained by the slowest part. 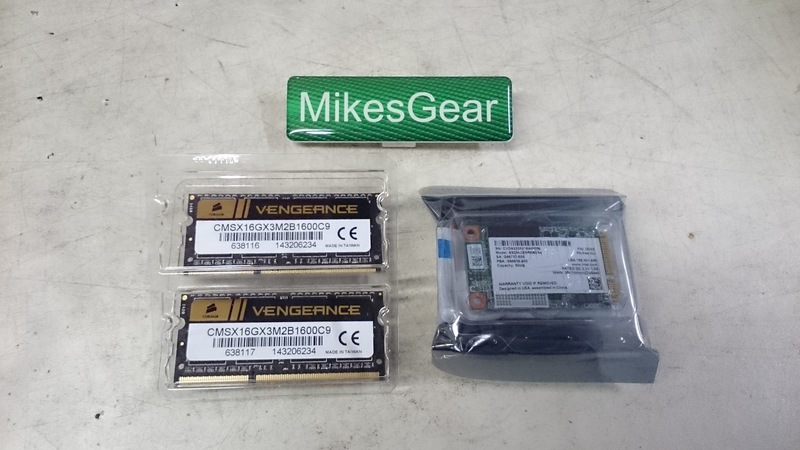 For this build, the customer picked a 16GB twin pack of Corsair Vengeance RAM and Intel 80Gb mSATA SSD. The RAM clips in place (the slots are handed, you won’t be able to plug them in backwards unless you use a hammer), and the mSATA SSD clips in similarly to the RAM, with one stand-off on the bottom left to keep it in place. I’ve left the retaining clip for the 2.5inch drive off, so you can see the RAM. Total time to assemble, less than 3 minutes! It’s off to install Win8 from a thumb drive now (no optical slot – I can’t remember the last time I installed Windows from a disc, and a thumb drive like the ThunderDisk is a much quicker installation medium anyway) and will be left to test overnight. This entry was posted on August 27, 2014, 10:33 pm and is filed under Mini PCs. You can follow any responses to this entry through RSS 2.0. You can leave a response, or trackback from your own site.